This light, Lebanese lentil salad is flavored with lemon juice, cumin, allspice, and parsley. 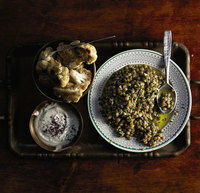 Author Carolyn Forche gave us the recipe for this Lebanese lentil salad. Serve it with roasted lamb or grilled sausages. Author Carolyn Forche gave us the recipe for this Lebanese lentil salad. Serve it as a side dish with roasted lamb or grilled sausages. Bring lentils and 3 cups water to a boil in a 2-qt. saucepan. Reduce heat to medium-low; simmer until lentils are tender, about 35 minutes. Drain lentils and set aside. Heat 2 tbsp. oil in an 8'' skillet over medium heat. Add garlic and cook until soft, 7–8 minutes. Remove pan from heat and whisk in remaining oil, lemon juice, cumin, and allspice. Pour the garlic mixture over lentils. Add parsley and mint and season the lentils with salt and pepper; toss to combine. Serve lentils at room temperature.